William Wood 'Billie' Middleton, son of Robert Henry Middleton and Dulcie Edith Williams, married to Marcella and buried in Fort Logan National Cemetery, Denver, Denver County, Colorado. 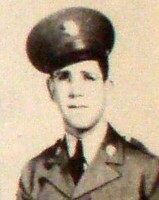 Middleton, William Wood, 94, of Denver, passed away Tuesday, November 22, 2011. He is survived by his brother, Jimmy Middleton, his sisters Dorothy McCutcheon and Marinella Hundley, his son, Erick Middleton, his daughter, Velma Rose, his daughter in-law, Josie Middleton, his granddaughter, Racheal Middleton and his grandson, Alex Middleton. Memorial services to be held at Advantage Aurora Chase Chapel, Friday, December 2, 2011 at 11:00 am, 1095 Havana St, Aurora. Burial services to follow at Fort Logan National Cemetery. In lieu of flowers, donations may be made to the Dumb Friends League, 2080 S. Quebec St., Denver CO 80231-3298.